FRISCO, Texas -- Twos were wild for Illinois State. The clock read 2:22 in the fourth quarter and the Redbirds trailed by only two points against the three-time defending national champions. Eighty yards separated ISU from a dramatic come-from-behind victory against mighty North Dakota State. Five plays and 44 seconds later, Illinois State’s do-it-all quarterback Tre Roberson was in the end zone on a 58-yard sprint. The Redbirds had the lead, 27-23, for the first time since the second quarter. Carson Wentz had big shoes to fill this year, replacing former four-year starter and Bison legend Brock Jensen. He did that and more, rallying and leading his team in the clutch. 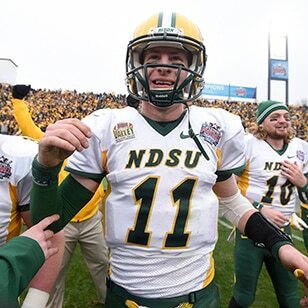 Wentz said it all started with the Bison tradition. But there was one problem that also turned out to be wild: There was too much time left. More than enough time for the Bison to go 78 yards in just six plays to tally the game’s final score and become the first FCS school to win four consecutive national championships in an instant classic. In the end, two wasn’t such a good number for the Redbirds in a 29-27 defeat. Spack had mentioned this week that his team, just 5-6 a year ago, was a year ahead of schedule. Especially with a new quarterback in Roberson. Sure he had been a starter at Indiana, but everything was new to him. And his head coach and his teammates had to adjust to his playmaking abilities. To no one’s surprise, it was the dynamic play of Roberson that gave the Bison defense fits all game long. He totaled 318 yards and four touchdowns, including a career-high 161 on the ground to help the Redbirds climb out of a 13-point second-half deficit -- something he’d done before this season. It was back in October at Western Illinois and the Redbirds trailed 27-6 late in the third quarter before Roberson exploded for four touchdowns, including two to receiver James O'Shaughnessy. So when Roberson hit O’Shaughnessy on a highlight reel touchdown with 2:11 left in the third quarter to cut the Bison lead to 20-14, it felt awfully familiar. The play itself was out of a video game. It saw Roberson scramble backward from the NDSU 41 to his own 40 before throwing across his body to find O’Shaughnessy in traffic along the sideline at the Bison 30. O’Shaughnessy somehow scampered through the NDSU secondary and into the end zone. With 8:05 remaining and down nine points, Roberson found O’Shaughnessy -- again in traffic -- for a 3-yard touchdown to cut the lead to the two. Roberson only needed to get the ball back. His defense did just that, forcing the Bison to punt from the Illinois State 41-yard line, despite converting a crucial fourth down just a few plays before. And that’s when he took off. It was a zone read, as Roberson decided to keep the ball instead of hand off to Marshuan Coprich and the hole opened wide. He was gone. His longest rush this season had given the Redbirds the lead. “We didn't know if he was going to score on that particular play, but I thought we were in pretty good shape,” Spack said. “My job was easy,” Roberson said of his rush. Even after North Dakota State’s score with 37 seconds remaining, Roberson had a chance. A great chance. The Bison missed their first extra point of the season when Adam Keller’s try was blocked. The deficit was just two. Surely, Roberson would lead his red-hot, school-record-breaking offense down the field for the game-winning touchdown. It was an offense that piled up 285 second-half yards against the nation’s third-ranked defense. Roberson hadn’t thrown an interception all postseason. Twelve total touchdowns in four games. And then, a pick. Esley Thorton stepped in front of his final pass. Comeback over. Deficit stuck at two. It was by far the closest any team had come to beating North Dakota State during its reign in Frisco with the previous being the 17-6 win against Sam Houston State in 2011. Though there might be no solace in that. Illinois State had their co-Missouri Valley Football Conference champions right where they wanted them. Until they didn’t. After all that, the Redbirds finish an unprecedented season as the No. 2 team.